Children in South Africa are facing a crisis. 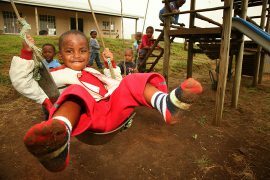 The continued spread of HIV/Aids throughout South Africa has created a staggering number of orphans, estimated at 3.7 million. Even more children are at risk. It’s a crisis we cannot ignore. South Africa has the largest number of HIV-infected people in the world. Approximately 7.1 million people in the country are infected with the virus. 320,000 children are estimated to be HIV positive. 55% of those are receiving antiretroviral treatment. Nearly half of the orphaned children lost one of more parent due to HIV/Aids-related diseases. The majority of South African children live in poverty in families that survive on less a $1 per day. Teenage girls are eight times more likely to contract the disease than their male counterparts. 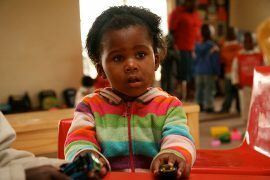 For South African children, these realities create a set of devastating challenges. The plight of these children starts at conception. Young women of child-bearing age have the highest infection rate, more than any other group. Every year, an increasing number of children contract the disease from mother-to-child transmission. Ninety percent of these infections are passed on to infants from mothers during pregnancy, childbirth or breast-feeding. To understand the escalation of the disease, in 1990, the infection rate for pregnant women was 0.7%. By 2005, the number had risen to 30.2%. The likelihood of a pregnant HIV positive woman passing the disease on to her unborn child is extremely high, unless she has access to antiretroviral drugs. Untreated, fifty percent of infants die before their second birthday. Children who were born before their mothers contracted HIV/Aids or who escaped transmission at birth or do not go unscathed. Although not infected with the disease, once their parents die, they become the surviving victims of it. Yet their crisis begins before they become orphaned. With a health system that is overtaxed and unable to respond to the demands of the HIV/Aids pandemic, home-based care is relied upon as the only viable option. Sick adults remain in their homes when they become too ill to work or care for themselves. Many times their children take on the role of primary caregiver of the terminally ill. Unable to attend school, the children stay at home to assume the adult responsibilities of running a home, to nurse dying family members, provide for their siblings and perform household chores. Economic insecurity combined with the emotional impact of losing a parent creates a cascade of devastating consequences for children. As a whole, children at risk are far more likely to live in large female-headed households in which the entire family is dependent on one adult. When she becomes ill, the survival of the family is placed in jeopardy. Even for children with two parents, inevitably both parents are at risk of contracting the disease through HIV transmission between the couple. As a parent’s health declines, unemployment and increased economic hardship ensues. Compromised health status comes with a lack of access to health care, education and support. Families are often unaware of government and community resources available to them and are unable to access them. What little family income existed is lost as parents succumb to the disease, plummeting the family into further impoverishment. For children, association with the disease carries a social stigma that leads to emotional neglect, discrimination and rejection within their own community. Children whose parents have died from HIV/Aids are assumed to also be carriers of the disease. Without the safe haven of a loving family, children are forced to endure loss, grief, fear and shame in social isolation, shunned by the wider community in which they reside. In rural areas, the death of a parent can mean the loss of land that is passed down generationally. Landless and without a home, the children have lost everything. Their survival, which was already tenuous, is put at even greater risk. With the erosion of the family structure, the siblings and extended family members often become separated. Alone, emotionally traumatized and living in extreme poverty, many children become homeless and suffer from malnutrition. They are forced to the city streets or dusty rural roads to beg for their survival where the prospects for their future is nothing but bleak. In the words of Nelson Mandela, “AIDS today in Africa is claiming more lives than the sum total of all wars, famines and floods and the ravages of such deadly diseases as malaria… We must act now for the sake of the world” (Nelson Mandela, in a closing address at the 14th International AIDS Conference in Barcelona, Spain, 2002).